You will earn 4,182 Reward Points. Earn 1 reward point for every 1 dollar spent. Mobile Cabinet: Mobile cabinets shall be of all-welded stainless steel construction. Cabinets shall have 18-gauge top and 20-gauge sides and bottom and shall include bottom corner bumpers. Cabinet bottom shall have center clean out hole. Casters shall be 4” (102 mm) diameter extra-load swivel (two with locking brake). Unit shall feature a heavy-duty independent undercarriage frame of galvanized steel to which casters shall be mounted. Units shall be NSF listed. Dispenser Tubes: Dispenser tubes shall be of welded stainless steel construction and shall drop into mobile cabinet top openings. Dispensers shall hang from cabinet opening by an 18-gauge flange ring, and feature three each 22-gauge vertical side supports welded to 20-gauge bottom plate. Self-leveling dish carriage shall be of welded stainless steel construction and shall travel vertically in dispenser tube with nylon guides for smooth operation. Carriage shall have 22-gauge removable dish platform. 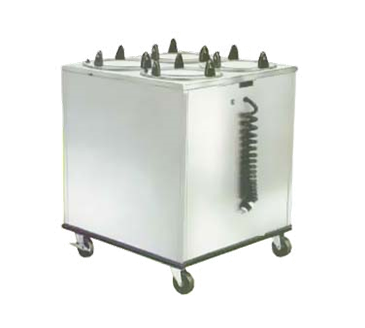 Dispensers shall feature flange mounted perimeter extension springs, which are detachable from the dish carriage, to provide adjustment without tools for different weight dishes. Each dispenser shall have a vertical stacking capacity of 25” (635 mm). Heating Unit: Unit shall be 120 VAC 60 Hz and shall have 6’ (1829 mm) coiled power supply cord with 5-15P NEMA plug (5-20P on Models 6409 and 6410) for 120 VAC. Cabinet shall have interior mounted electrical junction box with twist-lock receptacles for individual power to each dispenser. Dispenser tubes shall be fully enclosed in 22-gauge stainless steel, and have a circular bottom mounted 300 or 450 watt heater element. Heating system shall feature thermostatic control in a tamper protective location with safe high-end shut off. Control shall have Infinite settings between low and high temperature cut-outs. Thermostat shall be field adjustable for average interior air temperature between 100° F (38° C) and 175° F (79° C) at middle adjustable thermostatic setting. On-off switch and power indicator light shall be mounted on top flange of dispenser. Average dish temperature rise of 40° F (22° C) above ambient shall be achieved within one hour of initial heating cycle at middle adjustable thermostatic setting. Cabinet and dispenser tubes shall be UL listed.